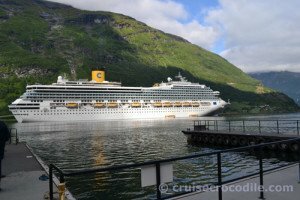 Cruise Port Guide Geiranger - Norway - Top rated port guide! 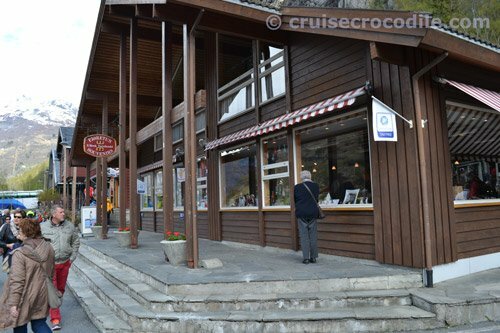 Our Geiranger cruise port guide gives you information about the docking location, cruise dock, transportation options and much more! 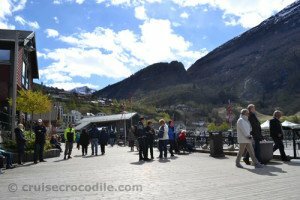 Welcome to the Geiranger cruise port guide. Geiranger is the smallest but most impressive place imaginable. If you are taking a cruise to Norway to see the Norwegian fjords make sure Geiranger is on your itinerary. It simply doesn’t get more impressive than this. The reason why Geiranger is different from your other fjord villages: the towering high waterfalls, the emerald-green scenery and near-sheer fjord walls. The narrow and deep blue Geirangerfjord is the only fjord in Norway that is listed on the UNESCO world heritage list. It is a 15 km long branch of the Storfjord and because of its steep sides it considered to be the most spectacular one of all. The village of Geiranger is nothing special. Imagine this is a small place where about 250 people live year round. In the winter it is isolated, cold with hardly any visitors, but in the summer this is perhaps the most popular destination in Scandinavia. The reason you will be visiting Geiranger is not for the town itself, but because of everything and anything you’ll find just outside of Geiranger. There is not a picture that you can take that wouldn’t be postcard worthy. Whether you are visiting the towering Mt. Dalsnibba, or heading the other way towards dramatic Eagle’s bend or just being in the famous Geiranger fjord all day long, it will not fail to amaze. Definitely make sure you do not stay in town, but get yourself on a bus, organise a hike or rent a boat. Whatever you do, make sure you are going out there. When in Geiranger you are in the Norwegian dream. This will be your view from the tender platform with your ship at anchor in the fjord. This is the pier where you will arrive in Geiranger. This is where you will find the tourist information centre and some souvenir shops straight on the dock. There is a wi-fi hotspot on the pier where these souvenirs shops are. When you visit Geiranger you are always tendering as there is no pier big enough for your ship. 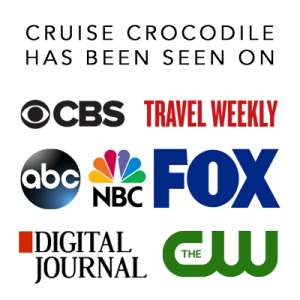 Since 2013 there is however the possibility of your ship to rent a floating pier, but as this will cost the ship a small fortune most ships will choose to tender. All tenders will arrive right in town in front of the souvenir shops and the tourist information centre. The centre of town, if you can even call it a centre, is right there. You’ll find that the town exist out of supermarket, a couple of souvenir shops, a hotel, a camping, a chocolate shop and that is about it. Therefore staying in town is not really what we could recommend anybody. There is a bus stop, but don’t count on any public transportation to be there and to be back on time as there might be a bus coming by once or twice a day. There are taxis available through the tourist information point that you’ll find on the dock. Please know they are limited and so reservations or booking pre hand are advised. Also know it is about +/- 700 NOK (100 USD) per hour and therefore a lot more expensive than a bus tour. There is a hop on hop off bus available in Geiranger. Forget about the usual concept of Hop on hop off busses though. If you buy a ticket it is valid for 1 ride. The bus takes you to the most visited and famous viewpoints where you’ll get about 15 minutes of free time. Order the tickets online or on the dock. The bus is not wheelchair accessible. Other things you can arrange through the tourist information at the desk or on the link above is: taxi service, car rental, fjord safari, fjord sightseeing, kayak tours, fishing tours, bike rental, rib cruise etc. There are truly some of the most impressive and beautiful hiking paths in the world situated in and around Geiranger. For those of you looking for an easy hike take the new “Waterfall walk” from town up to the Fjord Centre in about 30 minutes. The beginning of the waterfall walk is also marked for you in the map above. – How long is the tender ride? Depending on your position in the fjord between 2 and 10 minutes. – Weather wise: should I take a tour in the morning or the afternoon? You never know in Geiranger. There can be 4 seasons in a day here. When you have a good sunny day the photo’s are better in the morning, when you have a bad day chances are it will clear up in the afternoon. You really cant tell, although if I would book for myself I would book the afternoon. – How deep is the fjord? deep as the mountains are high. – What does Geiranger mean? It means spear-shaped fjord in old Norwegian. It will take your ship about 5 hours to get from open sea to Geiranger. Click here to see what your sailing route to Geiranger is and what there is to see along the way. At the end of the Eagle’s road you’ll find the Ornesvingen viewpoint. This one should definitely be on your list when visiting Geiranger. 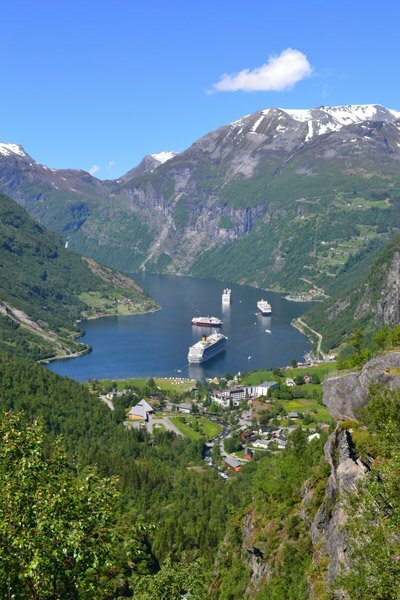 It gives you a view over Geiranger, your ship, the fjord and the seven sisters waterfall. From port it is 7 km / 15 min. drive to the north. This mountain farm is one that is open to the public. It is a great stop for a refreshment during a hike. Take a good look at this typical Norwegian farm house. If you look closely you will see numbers on the foundation stones of the farm. This is for future reference so the farmers know how to rebuild their house should a landslide come by. Continue here on 2 different hiking paths. From port it is 4 km / 1 hrs walk / 10 min drive to the north. Dalsnibba is the most famous mountain top in the area. Lots of bus tours will make a stop here. Do realise it is 1500 meter above sea level and therefore sometimes it could be you are in the cloud like you see on this picture. If you are lucky enough to have a clear day, you are able to see all the surrounding mountain tops and your ship all the way in the distance at anchor. Mt Dalsnibba is about 45 minute drive from the dock. From port is 38 km / 45 min drive to the south. The most famous waterfalls of all is the Seven Sisters Waterfall in the Geirangerfjord. About 15 minutes before your ships reached Geiranger and 15 minutes after it departs from Geiranger your ship will sail past it. Make sure to be ready to admire this magical waterfall. You can also visit the waterfall when you book the rib cruise or when you are going kayaking. Book these activities through the tourist information. Click on this item to be linked through. Which literally means: deep lake. On your way to Mt. Dalsnibba, about 30 minute drive from Geiranger, you automatically cross it. Make sure you make a photo stop at this 1000 m / 3200 ft high lake that is known for its depth of several hundred meter. This is where the locals go ice skating in the winter. This is what it looks like in early summer. If you are lucky you can even spot wild reindeer here. From port it is 18 km / 30 min drive to the south. Eagles Road There are 2 roads going in and out of Geiranger. One of these roads is the famous Eagle’s road. This is a steep stretch of road with 11 hair pin bends that opened up in 1955 to keep Geiranger accessible all year round. Navigating the road is an experience in itself. From port it is 1 km / 3 min drive to the north. There are a lot of hikes that you can do around Geiranger. Take into account that nothing is flat and it is all uphill. For easy hikes check out the “Waterfall walk” on this page. For the real deal start to plan ahead through the following link: http://www.geirangerfjord.no/hiking-map. AT OWN RISK: If you are interested to shoot this picture go the Flydals view point. Find the public bathroom and step over the small fence here AT OWN RISK. 10 meters in front of you you’ll see where and how to take the picture. From port it is 4 km / 10 min drive south. The waterfall walk is a new simple walk/staircase that opened up in July 2014. In about 20 minutes you can walk from the camping at sea level all the way up to the Norwegian Fjord Centre. The staircase will take you up with spectacular views over the waterfall, the fjord and your ship. Find the start at about 500 meter from the pier at the Geiranger camping. The Flydals viewpoint is not very high but it will already give you that exquisite view over the fjord. Make sure to stop when driving by or even walk up. From port it is 4 km / 10 min drive to the south. There are two roads going in and out of Geiranger. Geirangervegen or Gearing Road is the road going in south. Driving this road is an experience in itself. The hairpins bends you’ll have to negotiate and the ever changing landscapes along the way never fails to impress. The road goes up into the mountains to about 1500 meter above sea level. Find the start Geirangervegen in Geiranger. It is the road going south. Geiranger is a tender port. Geiranger offers several small piers where cruise passengers arrive when in port. Read the full Geiranger cruise port guide for all the information. A small white, wooden and octagonal church stands on top of the hill from Geiranger. It’s about a 20 minute uphill walk from town. Check with the tourist information for performances, because usually during the summer this church will give concerts during the day. From port it is 1 km walk to the south.